I have a new hoop to share with you! You can click on the image above to go right to the shop.....or keep on reading to hear more about the hoop. Need a heartfelt way to say "I love you" without saying those three little words? 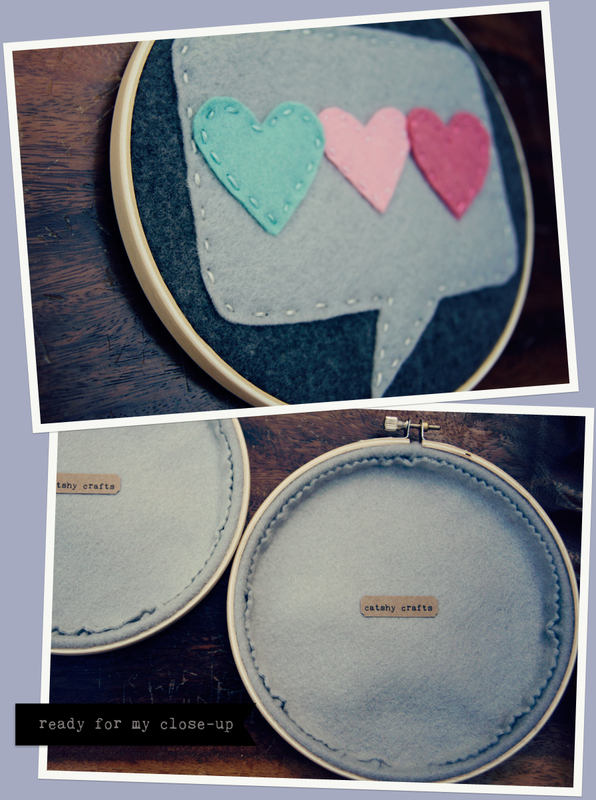 How about these three little *felt hearts* hand-stitched onto a light grey speech/thought bubble? The background is a charcoal felt background stretched onto a 6.5-inch wooden embroidery hoop that has been sanded smooth. The hoop is finished on the back with a layer of felt and a hand-made Catshy Crafts tag. If you would like to add a personalized tag to the back of the hoop to commemorate a special occasion (birthday, anniversary, wedding), just let me know! This would make a perfect Mother's Day, birthday, anniversary, baby shower, any day gift! This hoop is ready to ship immediately. As always, if you are looking for another color scheme or size of hoop, just let me know and I can create a custom order for you! Before I go.....You might have noticed that I changed the blog header to include this new hoop! You see, I love the spring colors of this new hoop. 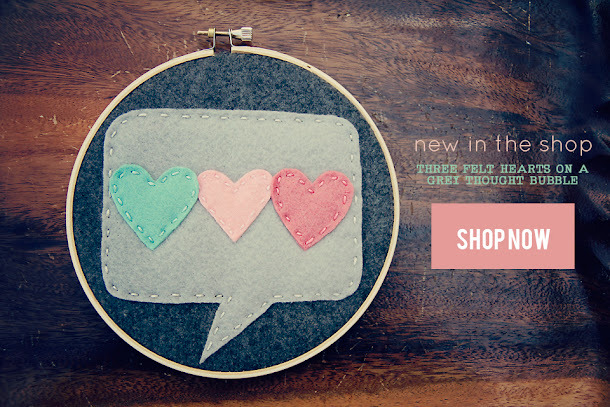 I also love the embroidered hearts and grey thought bubble, which to me, just about sum up my heartfelt hoops. Ha! Sorry for the pun. Anyway, hope you like the new look. Oh! One more thing....I just logged on Etsy and saw that my new hoop is already in a treasury! Thank you Samantha Pirok! That is just so cute!! I love the colors! How darling! The hoop and your header! Gorgeous! Loving the colours here too! so cute!!! the colours are lovely!